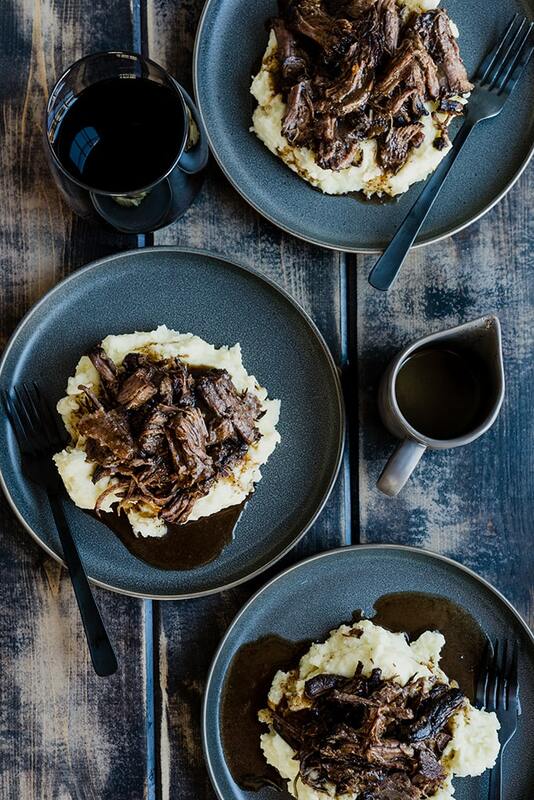 This braised red wine pot roast is the definition of cool weather comfort food. 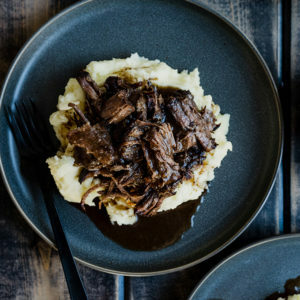 The chuck roast breaks down into slightly crispy and super tender shreds, and the resulting red wine braising liquid becomes a subtlety sweet, complex sauce. Amp up the cozy factor by serving it over buttery, rich mashed potatoes. This is an easy, no frills dutch oven recipe that’s perfect for any occassion. Mmmm, mmmmm pot roast. There are so many reasons to love this classic Amerian recipe. My go-to method for perfectly braised red wine pot roast is a slow roast in the dutch oven. I love my slow cooker for any number of recipes, but not this one. Just like my recipe for dutch oven pulled pork, dutch oven pot roast comes out tender but crispy, super moist and juicy, and jam-packed with flavor. It’s a combination you just can’t replicate in a crockpot. This recipe is not hard. In fact, it’s pretty super duper easy, but it’s a time investment. For that effort, you shall be rewarded with a home that smells so good you’ll want to lick the walls and a bone-warming meal that will make you feel all of the feels inside (one of those feels being a very happy belly). This recipe isn’t weeknight friendly, but that’s okay. Reserve this savory pot roast for Sunday dinner, family get-togethers or as the centerpiece of a cozy Christmas Eve or Day dinner. 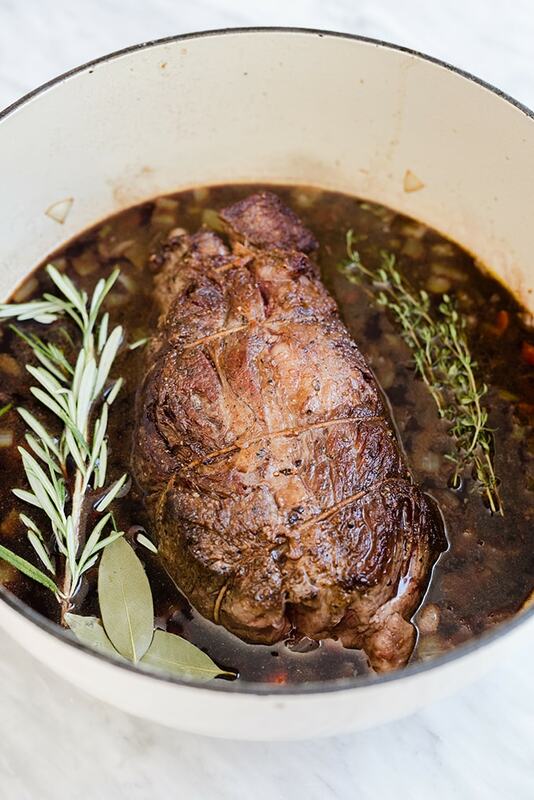 I make my red wine pot roast the classic way – seared, then slow braised in a dutch oven with mirepoix, lots of red wine, lots of herbs, and lots of time. I also add a little balsamic vinegar for sweetness and funsies. What Cut of Meat Should I Use for Pot Roast? I use chuck roast. It’s cheap, readily available, and packed with lots of fat (flavor) and connective tissue (gelatin). This article from The Kitchn is a most excellent resource for selecting a cut for pot roast. Should I Truss the Chuck Roast? Okay fine, that last one doesn’t count for most reasonable people, but it works for me. I’d normally tell you that you should always do you, but in this case, I urge you to pay attention to first three points and tie up your roast. Now that you’ve selected your proper cut of meat and trussed it up, it’s time to season and sear that bad boy. Rub the whole thing down with some good sea or kosher salt and cracked black pepper. This isn’t a job for “sprinkling”. This is a job for rubbing. So wash your hands and get ready to get dirty, because you’ll want to really rub and pat the salt and pepper into the roast. The next logical step is to brown that baby up in your dutch oven using bacon fat. Browning doesn’t actually lock in the juices (see this article from Serious Eats), but it does serve the purpose of releasing lots of flavor into the cooking fat, which will then flavor the braising liquid, which will in turn flavor the sauce. It also enhances the finished texture by giving the roast a nice crust. So, brown yo’ roast. Now it’s veggie-time. I handle my veggies a little differently for this pot roast recipe. Instead of tossing them in at the end as an accompaniment to the roast, I add them in as mirepoix in the very beginning for the purpose of flavoring the red wine jus. You’ll sauté the vegetables just until they’re soft, and then deglaze them with the red wine. Then you’ll add a few glugs of balsamic vinegar for added sweetness and complexity, a few fresh herbs, and a cup or so of beef broth. So good. Add the browned chuck roast back to the dutch oven, cover it up, and pop it in the oven. You’ll slowly roast at 275 for anywhere from 3-5 hours depending on the size of your beef cut. The meat is ready when you can insert a fork into the pot roast and the meat pulls away with absolutely no resistance. I typically select a 3-ish pound cut when I’m cooking for my little family, which is enough for dinner plus at least one round of leftovers, and it takes about 3-3.5 hours. Larger cuts will take longer. Once the roast is cooked, remove it from the duch oven and set aside onto a plate. You’ll shred it just before serving. Strain the vegetables from the liquid, squishing them with the back of a wooden spoon to extract as much flavor as possible. Then add another half a cup or so of beef broth to the braising liquid and simmer it until reduced by about half. Treat yourself, and finish it off with a couple of tablespoons of good quality butter for richness. And…we’re done! 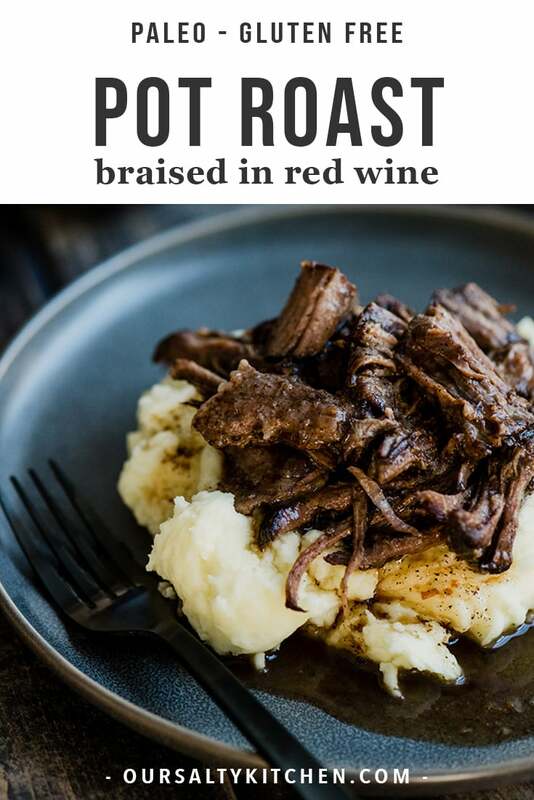 Red wine pot roast my friends. It’s totally what’s for dinner (on the weekends). 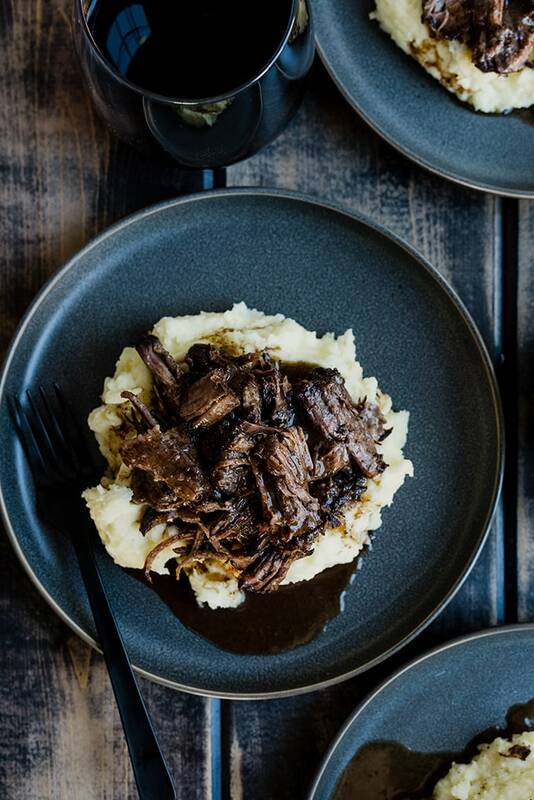 This braised red wine pot roast is an easy one pot recipe the entire family will love! 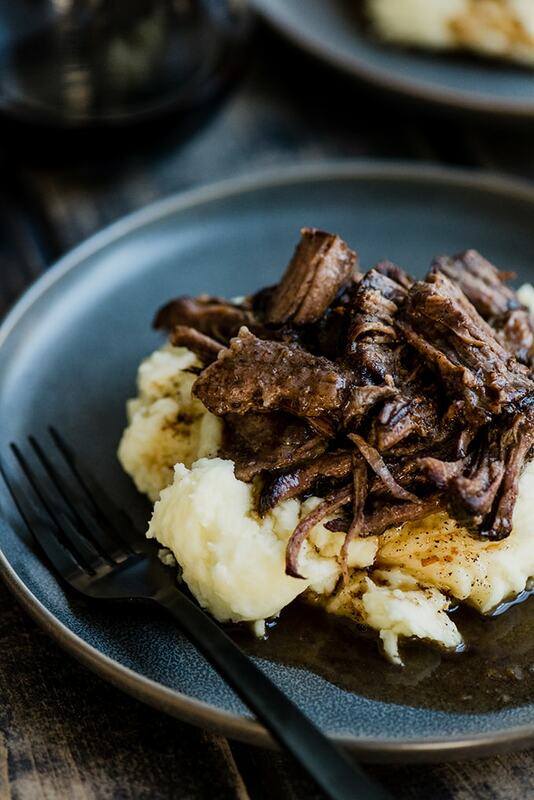 It's perfect over buttery mashed potatoes, smothered with savory jus. 2 carrots peeled and diced to 1/2"
2 celery stalks diced to 1/2"
1 large onion diced to 1/2"
Preheat the oven to 275. 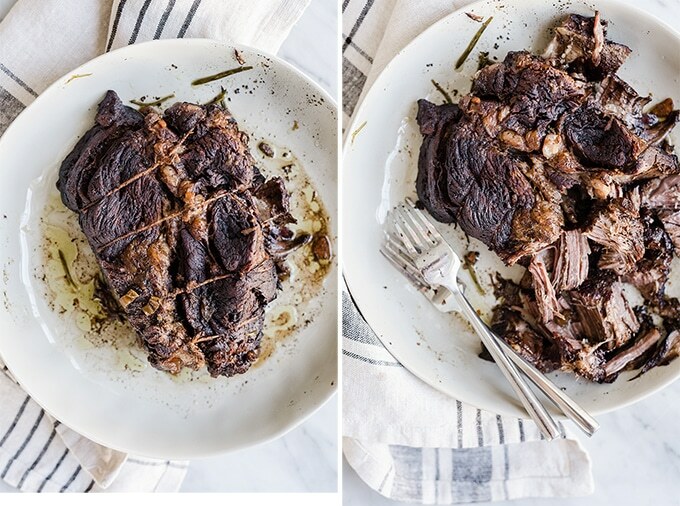 Pat the chuck roast dry with paper towels or a cotton kitchen towel. Truss the roast by tying pieces of cotton twine at 2-3" intervals along its length. Sprinkle the chuck roast with salt and pepper, patting down the seasoning into the flesh. Heat a dutch oven over medium high heat. Add the bacon fat and heat until it shimmers. Place the roast in the dutch oven and sear until golden brown and crisp, 4-5 minutes per side. You may need to use a pair of long tongs to hold up the roast on the shorter edges. Transfer the seared roast to plate and set aside. Add the carrots, celery, and onion to the dutch oven and sauté, stirring occasionally, until soft, 6-7 minutes. Add the garlic, stir into the mirepoix, and sauté another minute or two until the garlic is fragrant. Add 1 cup of red wine to the pan to deglaze. Stir continuously, scraping up the browned bits from the bottom of the pan, until the wine stops bubbling, then turn off the burner heat. Using tongs, place the roast back into the dutch oven and nestle into the vegetables and braising liquid. Pour 1 cup of beef broth and the balsamic vinegar into the braising liquid. Then add enough additional red wine so that half of the roast is submerged in braising liquid (I used an additional 1.5 cups; you may need more or less depending on the size of your roast). Place the herbs in the braising liquid. Cover the pot and transfer to the oven. Braise for 3.5-5 hours, depending on the size of the roast. My 3 pound roast took about 3.5 hours. Starting testing for doneness around the 3-hour mark if closer to 3 pounds, and the 4-hour mark if closer to 4 pounds. The roast is ready when you can insert a fork into the flesh and it shreds without resistance. Remove the dutch oven from the oven. Remove the pot roast from the dutch oven with a pair of tongs and set aside onto a platter. Place a mesh strainer over a bowl, and pour the braising liquid and vegetables through the strainer. With the back of a wooden spoon, gently press on the vegetables and extract as much liquid (and flavor) as possible from them. Discard the braising vegetables. Next you'll need to skim off the fat, which will have settled to the top of the liquid. I do this using paper towels. Simply lay a paper towel over the liquid until it just touches the surface. The paper towel will absorb the layer of fat on top of the jus. Discard the paper towel once it's saturated and repeat as needed until the fat is skimmed. Add the skimmed braising liquid to the dutch oven and place on a burner over high heat. Add the remaining 1/2 cup of beef broth to the braising liquid. Bring it to a boil, then reduce to a simmer for 5 minutes. Turn off the heat. Add 2 tablespoons of cold butter to the jus and whisk until emulsified. 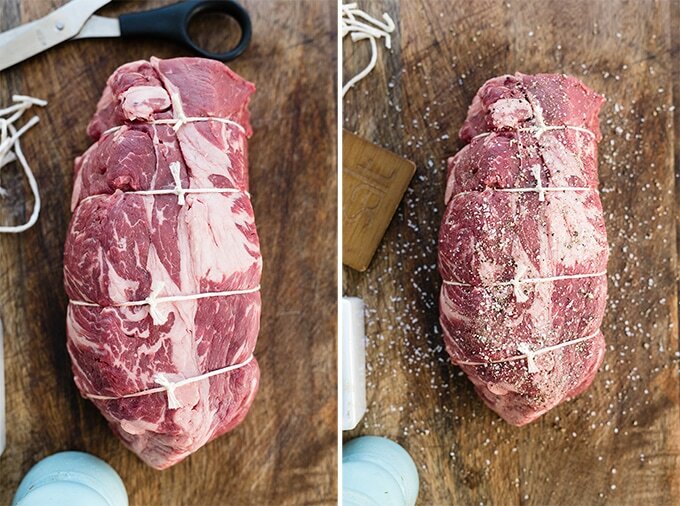 Cut the trussing twine with scissors, remove from the pot roast and discard the twine. Shred the pot roast into large chunks using 2 forks. Dress with the red wine jus and serve as desired. We love this over buttery mashed potatoes. This was amazing! I had to cook my roast at a slightly higher temp for about 3.5/4 hours since my oven loses a lot of heat. Highly recommend this recipe! We ate ours like a stew with the vegetables and skipped the final steps (straining & sauce over mashed potatoes). Looking forward to following the recipe through next time! Thanks for the great recipe! So glad you loved it! I love that you made it “your own” by keeping the veggies. Makes for a lovely pot-pot meal. 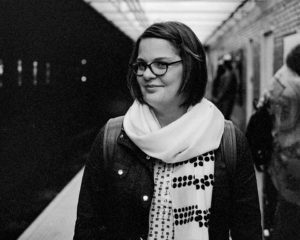 Holy cow, I just found your site and I LOVE the way you write. Your recipe sounds delish, too, but I was just so smitten with your wordsmithing (and appreciated the way you bolded certain words to call out which step we were on). I was chuckling a bit throughout my read. Love your voice and tone. Looking forward to trying the au jus, too. Thank you!! Hi, I would love to make this! But I have two questions, what wine do you recommend? My other question is this 275F or 275C? I am assuming it is Fahrenheit but I just want to be sure! Yes, 275F. Thank you for pointing that out! I like a dry red for this recipe, like Pinot Noir. Nothing too sweet.